Donna J. Nicol is an associate professor and the chair of Africana studies at California State University Dominguez Hills. Jennifer A. Yee is an associate professor of Asian American Studies at California State University, Fullerton. 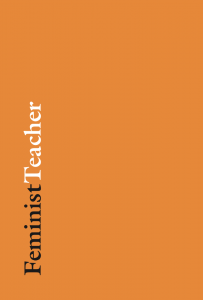 Nicol and Yee recently answered some questions for us on their article, “‘Reclaiming Our Time’: Women of Color Faculty and Radical Self-Care in the Academy” from Feminist Teacher. What is radical self-care and why is this important for women faculty of color? Radical self-care involves practices that not only keep us physically and psychologically healthy and fit but also allow us to reflect on and make deliberative choices about how we allocate our time and energy, how we choose projects which align with our values and how we remain unapologetically ourselves in the face of often unrealistic and unrelenting demands within the academy. We call this practice “radical” because it fundamentally alters how we allocate our time, money and energy and seeks to revolutionize our workplace practices. Radical self-care is especially important for women faculty of color because of a phenomenon we explore in our article which merges Padilla’s (1994) concept of “cultural taxation” and Hirschfield and Joseph’s (2012) concept of “identity taxation” in which women of color are saddled with unpaid and unacknowledged labor serving on all of the university diversity committees and mothering students through various academic and personal crises. Identifying “radical self-care” is important for women faculty of color because we have often been socialized and conditioned to believe that making choices to take care of ourselves is negative, selfish, and non-collegial in both personal and professional environments. As a concept, radical self-care creates the professional space for women faculty of color to say “no.” We cannot realize our values and personal goals for the world if we are unwell. Re-framing self-care as “radical” helps us to understand that our life missions as change agents in society relies on our ability to protect our selves, our health, and our lives. Practicing radical self-care involves identifying and acknowledging multiple forms of intersectional oppression that women faculty of color face. It’s a sad commentary that caring for ourselves and one another is revolutionary rather than normal to transform institutional policies and practices. Can you discuss why this study is important to you both personally? ?Early in our careers as faculty, we made an agreement to “not let this job kill us” after discussing our concerns with how institutions were socializing junior faculty to prioritize work to the point of risking their health and happiness outside of the academy. Since we both came to the faculty via a non-traditional route as university administrators, we also had enough experience assessing the institutional culture to know when to push back and say no to various demands which took us away from our primary reason for being faculty – engaging in research and teaching our students. We managed to be fairly successful early in our faculty career to hold onto our promise to one another. However, when Jennifer was diagnosed with kidney cancer and Donna fell ill with complications of polycystic ovarian syndrome, this forced us both to further re-evaluate and make new choices for how we spent time with our families, in our jobs, and how we took care of ourselves physically, psychologically and spiritually. DN: Our study was personally important to me, because as a woman of color in academia, I want to share our experiences as a way to prevent the “imposter syndrome” or that sense of doubt that is all too common among people who are new to the profession especially those of us who are viewed as “outsiders-within” because of our race, gender, sexual orientation or immigrant status. Imposter syndrome often leads to unhealthy behaviors which affects our emotional, physical and psychological well-being. My hope is that our study can help someone avoid the same pitfalls that we’ve encountered along the way. JAY: Sharing the results of our study is important to me personally because I don’t want others to go through what I’ve experienced. I’m generally a very private person, but I’ve made a political and professional choice to share some of the particulars of my experience with the hope that the world can be more compassionate, kind, and loving. Perhaps leaders and policy-makers may learn how to establish more humane professional norms, policies, and practices. Perhaps people facing oppression will gain language and strategies to maintain and protect who they are in spite of pressure to be otherwise. What were some of the biggest lessons you took away from choosing radical self-care?? JAY: Interestingly, it was the process of realizing I needed to choose radical self-care that was one of my biggest lessons. I learned that in spite of everyone’s best intentions, if the institutional policies and practices did not value me as an individual and my health, then some leadership decisions would not be made for my personal safety and well-being. I was shocked to learn that many institutional norms, policies, and values would prevent other well-intended people from choosing to make decisions to support my ability to return to work while engaging in a safe process of cancer survivorship. I learned that choosing radical self-care and leaning on my closest colleagues for support was necessary to maintain my health and my chosen livelihood. I would not be a tenured faculty member today if I hadn’t chosen radical self-care. DN: The biggest lesson I learned is how expendable we all are to the university and how I needed to employ a radical self-care practice as a way to push back when the demands became too much. While I saw some of this as a graduate student, this feeling like no one was going to advocate on my behalf was intensified in my work as an administrator (these positions were often “at-will” – there was no job security, and emphasized performance over people). I also saw how my former institution treated Jennifer through her cancer survivorship (such as capping the amount of leave time we could donate to help her through her treatment). I simply made the choice to not let my job become my life and became more selective about the projects I took on or the people I surrounded myself with. When my health took a turn of its own, I doubled-down on being selective about how I allocated my time, energy and physical presence. Do you have any suggestions for how someone might begin performing radical self-care? Each person is unique. We offer these ideas as ways for people to choose what resonates best with them. Create a practice of reflection. Make time to consider your life, where you’ve come from, where you are now, and where you may wish to be. The purpose is to raise consciousness, determine what’s important to you, how your life aligns with your values. Consider if you’re well, personally centered and at peace and if not, what is out of place for you. This practice may take the form of journaling, going for walks or drives, talking with friends and loved ones, engaging in counseling, praying, meditating, exercising, participating in a spiritual community, and more. Identify what you want to keep. If the values, norms, and practices in your life are working well, what can you do to continue these norms and practices intentionally? How do you ensure (if it’s in your power/control) that you maintain what keeps you well and centered? If it’s not in your power/control, how do you incorporate alternatives into your life? Identify what you want to discontinue. If you realize your values, beliefs, norms, and practices are not working well for you, what can you do to stop or disengage from the situation? Brainstorm ways that you may individually or in community make decisions to stop or disengage. Find friends. All transformative movements have resulted from communities organizing. Are there people who can be part of your journey? Could you maintain or establish friendships with people who share your values and beliefs and can begin to share and affirm your practices? Our collaboration has evolved from colleagues to friends to collaborating activists. We call each other to vent, laugh, brainstorm, and seek advice. We always remind each other to take care of ourselves and to steer back to doing what’s healthy. Know your worth and your power. It may seem strange to name and affirm your worth to yourself, but it’s entirely necessary in academia or any institution with a tendency to value outcomes, prestige, and profits over people, life, and process. In addition, it’s also important to know the privilege and power that come with holding our positions in academia, and the responsibility of exercising our power thoughtfully in the service of our values to promote anti-oppressive practices and social justice. We also acknowledge the power and privilege of our option to leave our universities so that we do not feel powerless. While we have chosen vocational careers in higher education, we know from our life experiences that we would seek work in other settings if our current situations are unhealthy for us. Make choices to actualize your values. Easier said than done, become conscious of whether your choices help you to manifest your values. Because our intersectional identities as women faculty of color often translate into multiple representation of identity groups to others, we are likely to be asked to participate in multiple committees and work that may somewhat align with our values, but not closely. Be aware that saying yes to one commitment means that your opportunity to say yes to another much more closely aligned with your values may close because you do not have the capacity. Have fun! Joy is an integral part of being human, and having fun or enjoying what you do makes life worthwhile.